Info "Pull out the giant carrot and then we'll feast like kings!" Carrot Away is a Microgame in WarioWare: Smooth Moves. It is in Mona's stage. 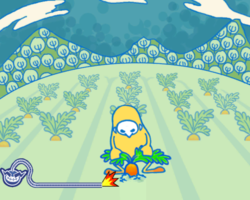 The player needs to yank carrots to eat as it is harvest time. 1st level difficulty: The player needs to pull only 1 carrot. 2nd level difficulty: The player needs to pull 2 carrots. 3rd level difficulty: The player needs to pull 3 carrots. This page was last edited on February 19, 2018, at 16:45.